The Espresso Cap capsules will let you make delicious Italian espressos with your Cubo Espresso Cap machine. The selection of coffee beans, the rigorous roasting and care taken in packaging means that the Espresso Cap capsules offers the best Italian coffee, cup after cup. Discover other drinks such as cappucinno/latte, tea, hot chocolate, etc. 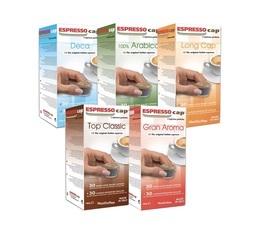 These Espresso Cap capsules are available in packs of 30, 120 and 240 at the best price. 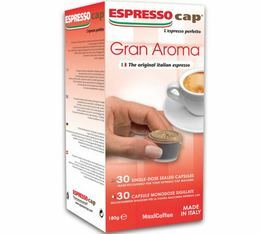 Try these 30 Gran Aroma capsules for the Espresso Cap Cubo: a strong coffee with an intense body. 30 x 100% Arabica capsules for Cubo machines by Espresso Cap. 30 x Decaffeinated capsules for Cubo machines by Espresso Cap. Discover Decaffeinated (50% robusta 50% arabica): all the flavour of a real espresso with less than 0.1% caffeine. 30 x Top Classic capsules for Cubo machines by Espresso Cap. 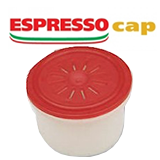 Discover 30 Orzo Espresso Cap capsules for Espresso Cap machines (Cubo, Tekna, Casco, Termozeta, etc.) These Orzo capsules, with a roasted barley base, are packaged in pairs in "freshness" sachets. Preparing your drink is super simple with these Espresso Cap capsules! Discover 30 English Tea Espresso Cap capsules for Espresso Cap machines (Cubo, Tekna, Casco, Termozeta, etc.) The black tea capsules are packaged in pairs in "freshness" sachets. Preparing your drink is super simple with these Espresso Cap capsules! Discover 30 Cappuccino Espresso Cap capsules for Espresso Cap machines (Cubo, Tekna, Casco, Termozeta, etc.) These Cappuccino capsules are packaged in pairs in "freshness" sachets. Preparing your drink is super simple with these Espresso Cap capsules! Discover 30 Cioccolata Espresso Cap capsules for Espresso Cap machines (Cubo, Tekna, Casco, Termozeta, etc.) Chocolate capsules are packaged in pairs in "freshness" sachets. Preparing your drink is super simple with these Espresso Cap capsules! A strong blend and full body in a capsule. 120 x Decaffeinated capsules for Cubo machines by Espresso Cap. 120 x 100% Arabica capsules for Cubo machines by Espresso Cap. 120 x Top Classic capsules for Cubo machines by Espresso Cap. Pack of 120 Orzo Espresso Cap capsules for Espresso Cap machines (Cubo, Tekna, Casco, Termozeta, etc.) These Orzo capsules, with a roasted barley base, are packaged in pairs in "freshness" sachets. Preparing your drink is super simple with these Espresso Cap capsules! Pack of 120 Cappuccino Espresso Cap capsules for Espresso Cap machines (Cubo, Tekna, Casco, Termozeta, etc.) These Cappuccino capsules are packaged in pairs in "freshness" sachets. Preparing your drink is super simple with these Espresso Cap capsules! Pack of 120 Cioccolata Espresso Cap capsules for Espresso Cap machines (Cubo, Tekna, Casco, Termozeta, etc.) These chocolate capsules are packaged in pairs in "freshness" sachets. Preparing your drink is super simple with these Espresso Cap capsules! 240 x Decaffeinated capsules for Cubo machines by Espresso Cap. 240 x 100% Arabica capsules for Cubo machines by Espresso Cap. 240 x Top Classic capsules for Cubo machines by Espresso Cap. Pack of 240 Orzo Espresso Cap capsules for Espresso Cap machines (Cubo, Tekna, Casco, Termozeta, etc.) These Orzo capsules, with a roasted barley base, are packaged in pairs in "freshness" sachets. Preparing your drink is super simple with these Espresso Cap capsules! Pack of 240 Cappuccino Espresso Cap capsules for Espresso Cap machines (Cubo, Tekna, Casco, Termozeta, etc.) These Cappuccino capsules are packaged in pairs in "freshness" sachets. Preparing your drink is super simple with these Espresso Cap capsules! Pack of 240 Cioccolata Espresso Cap capsules for Espresso Cap machines (Cubo, Tekna, Casco, Termozeta, etc.) These chocolate capsules are packaged in pairs in "freshness" sachets. Preparing your drink is super simple with these Espresso Cap capsules!